The Vancouver Condo Buzz » FINAL TOWER at CentreView North Vancouver Condos in Central Lonsdale by Onni! North Shore View Residences For Sale PLUS Amazing Wellness Centre Amenities! SWEAT > Be active in CentreView’s 3,300 sq.ft. professionally-equipped fitness centre, complete with squash court, yoga room, separate change rooms as well as steam room and sauna. PLAY > Enjoy over 10,000 sq.ft. of indoor amenity space, including a games room, media room, and spacious lounge with full kitchen. RELAX > Relax in CentreView’s 17,000 sq.ft. private outdoor oasis. Immerse yourself in the warm serenity of the hot tub, or take a dip in the pool. SOCIALIZE > Catch up with friends on the expansive and beautifully landscaped rooftop, boasting a fully-equipped BBQ area, garden plots, and children’s playground. 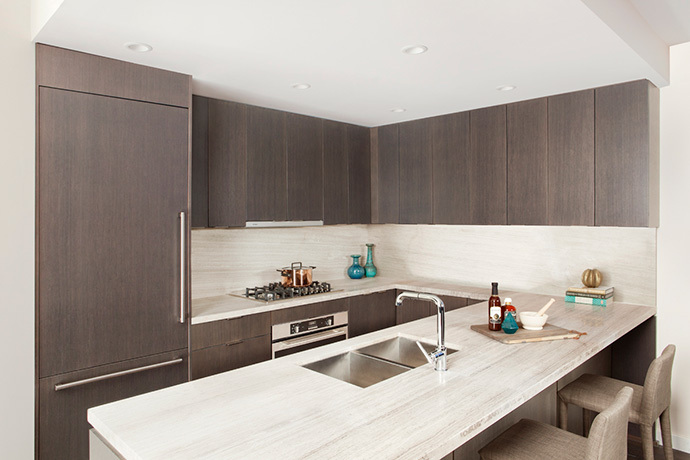 The beautiful homes at CentreView by Onni (final tower condos) will feature amazing gourmet kitchens that feature a high-end appliance package. These appliances include 30” Italian Fulgor Milano convection wall oven and stainless steel five burner gas cooktop in addition to a 30” integrated paneled Fhiaba fridge with ice maker or 24” integrated paneled Blomberg fridge. Both options have bottom mounted freezer as per floor plan. Other kitchen features include cabinetry with modern pulls and soft close mechanisms in addition to a convenient pull out basket mounted in cabinet below the extra deep stainless steel under mounted sink (with garburator). There is a Kohler polished chrome kitchen faucet with extractable spray in addition to custom flat planel wood cabinetry with rift cut oak veneer face featuring wood gables and island backs. 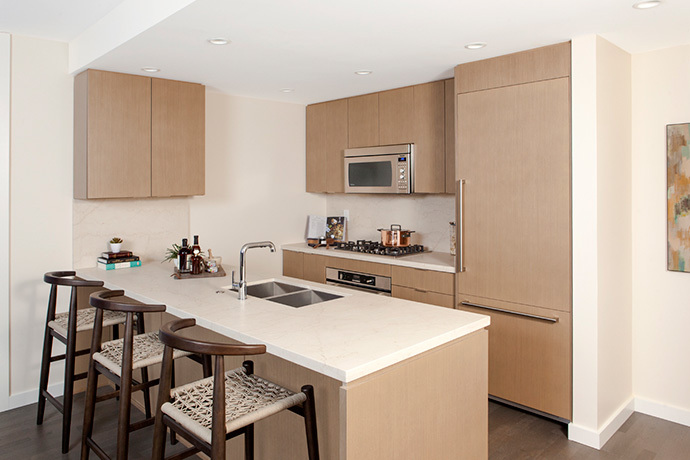 The premium kitchen features extend to solid 1 ½” double nose composite counters with extended breakfast bars and option to upgrade to honed natural stone as per floor plan. The kitchens also have Blomberg Energy Star rated integrated paneled dishwasher as well as a slim profile Faber hood fan with under counter Panasonic microwave with trim kit. Bathrooms at the Final Tower at CentreView Central Lonsdale will feature beautiful large format travertine stone floors with NuHeat heated flooring in the master ensuite or primary bathroom depending on your floor plan. As well, bathrooms will have solid marble countertops with a three inch high waterfall face and six inch high backsplash. Bathrooms also have flat panel wooden cabinetry with sleek under mount sink with single lever faucet. The presales North Vancouver CentreView final tower condo residences will also feature deep soaker tub with natural stone tile apron front or deck and master ensuites will have natural stone tile surrounding tub and shower walls. The guest bathrooms have large format ceramic tiled surrounds for the tub and on shower walls. Another premium finishing feature includes frameless glass enclosed shower with tiled base equipped with single lever, pressure balanced control and a recessed tile niche for storage. 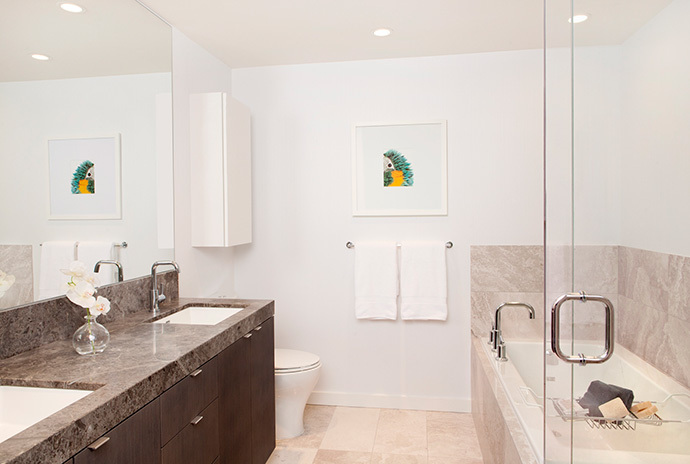 The bathrooms also have sleek dual flush Kohler toilets and large medicine cabinetry in all bathrooms. Final touches include contemporary and functional mirror, wall sconces and pot lights. The Final Tower CentreView Condos in North Vancouver will feature 2 colour schemes to personalize your home that are called Indian Arm and Burrard Inlet. The entry, living/dining areas have wide plank contemporary laminate floors with an option to upgrade to premium engineered hardwood. Laundry closets have ceramic tiled flooring and the bedrooms have 100% nylon stain resistant carpets. All closets have built in organizers and there is a Whirlpool full sized high efficiency front loading stacked washer and dryer included. There is both heating and cooling and the homes have roller blinds on all exterior windows (which are double glazed and Low-E). 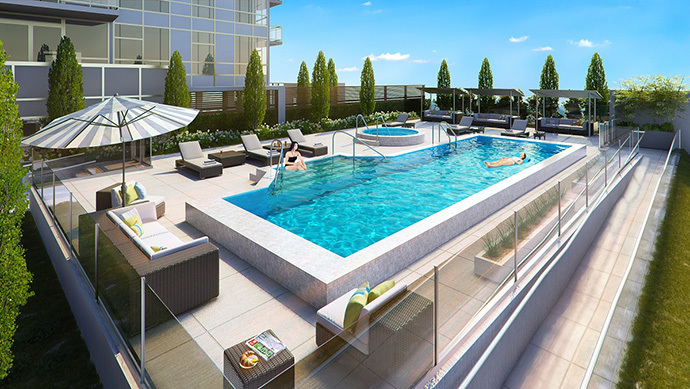 All homes at CentreView North Vancouver condos will have large outdoor balconies or patios. The high-rise towers at CentreView by Onni will have solid reinforced concrete construction and state of the art security systems with electronic keyless lobby entry phone and restructure floor access. 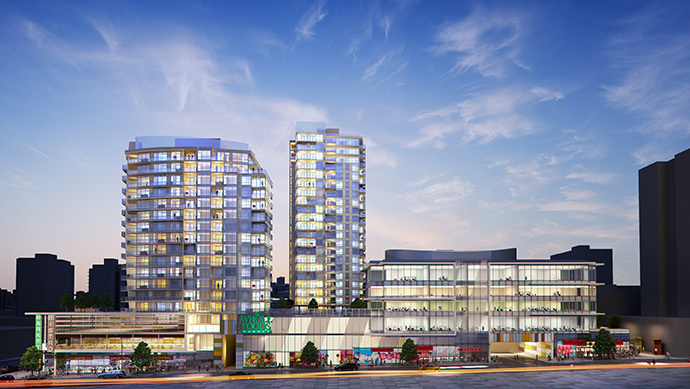 In addition, the Final Tower at CentreView North Vancouver will feature a well lit underground parking garage, well lit storage and bike rooms with motion sensors and homes that are pre-wired for in suite security systems. All homes have solid core entry doors with peephole and deadbolt and all homebuyers will receive the comprehensive 2/5/10 year home warranty protection plan. Onni’s newest mixed-use development, CentreView, will be located at the gateway to North Vancouver on 13th and Lonsdale. 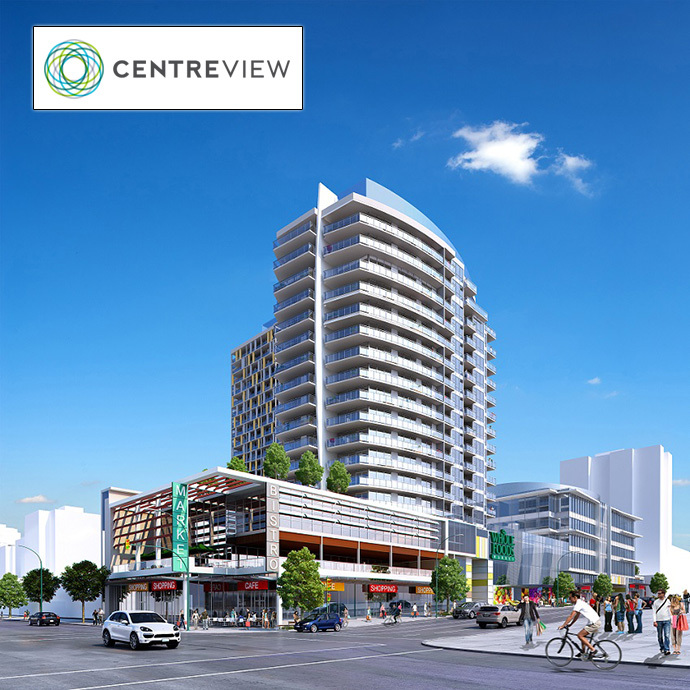 CentreView will be the new landmark destination, offering over 90,000 sq ft of prime retail space with extensive underground parking, more than 80,000 sq ft of office space and a childcare facility. Anchored by organic and natural grocer Whole Foods Market, CentreView is also expected to feature a national pharmacy, coffee shop, restaurant, and professional services. There will be 1-2 bedroom homes available, offering panoramic views from Vancouver to the North Shore mountains. Centreview will be the place where you can work, shop, and play just steps from your new home.